I've been awake since 4:00 a.m., so I figured I might as well blog. I'm in New York for Publishing University, and I have been tossing and turning trying to figure out how to obtain my Book Expo America badge for tomorrow. BEA begins tomorrow and I have a ticket to the children authors roundtable breakfast which is being moderated by Sarah Ferguson. If she is not arrested for trying to sell out Prince Andrew. The problem is that I have PU sessions all day today with a closing reception at 5:00, and the BEA registration area is only open 8-5. How am I supposed to get my badge and breakfast ticket before 8 tomorrow? The exhibit hall is 17 blocks from my hotel. I don't even know yet how I am supposed to get there from here. Apparently it is located in an industrial area, so the trains don't go directly there. I've heard taking a cab during rush hour is iffy, too. I guess I will have to miss a couple sessions today and go to the Javits Center. Anyway, that is why I can't sleep. The sessions for PU were really informative yesterday. My head is spinning with all the new information that was flying around. I've met some interesting people, and heard some truly inspiring success stories. If you are interested in more details, check out my Write Formation blog http://tinyurl.com/39vjao8 where I summarized yesterday's events. On Sunday I leave for New York to attend Publishing University, which is sponsored by the Independent Book Publishers of America (IBPA). PU takes place Monday afternoon and all day Tuesday. Following the two day PU is Book Expo America, the largest gathering of book stores in North America. Basically the authors and publishers are trying to entice the book stores to carry their books. The kick-off speaker Tuesday night is Barbra Streisand, of whom I have been a fan since 8th grade. Babs has a book coming out this fall, thus her willingness to make a public appearance despite her extreme shyness. So here is how it works: anyone with a badge to book expo can get in to see Babs, though it is first come, first served and seating is limited. No problem with that as I have an author's badge (God that sounds good to say!) Yesterday I found out that you have to pick up your free ticket to get in, and here is how you do that. You go to the Javits Center (17 blocks away from the hotel where PU is being held) between 1-5 on Monday or 8-5 on Tuesday, and when the tickets are gone, they're gone. Okay, so basically anyone attending PU will not be able to get a ticket. But the absurdness gets worse. The line to see Babs can begin cuing at noon on Tuesday, and the doors won't open until 4. Any people not in their seats by 5:45 will lose their seats, and the talk begins at 6:00. So basically even if I managed to get a ticket to see her, I would have to miss all of PU's Tuesday afternoon sessions to stand in line. Not! Sounds like a lot of B.S. to me! I needed to pick up some rolls of stamps today, and thinking the lines would be short (or non-existent) I headed to the Post Office at Crestwood Mall. Surprised to see three people in line at a place that rarely sees three cars in the parking lot anymore, I took my place at the end of the line. The man at the counter was apparently sending something overseas that required custom forms to be completed, so it was going to be awhile. I was checking out the hair of the person (male? female?) in front of me as it looked like it had been colored. Having changed my own hair color this week, I was thinking the color was not quite right. All of a sudden some yellow appeared from under the man's hair. What the heck??? It was a parakeet! What I at first thought was bird crap on the guys shoulder was in fact shells from the seeds the man was feeding the bird over his shoulder. The bird's name was Sunshine. Remember that John Denver song? "Sunshine on my shoulder makes me happy..." Could so easily be "Sunshine on my should makes me crappy..."
By now a second employee came out of the back room and took the second person in line over to her counter. She quickly bought a book of stamps, had her letter weighed and stamped, and was on her way. That brought up birdman. He proceeded to tell the clerk how he and Sunshine are inseparable, (in fact Sunshine had showered with him that morning), and he set the bird on the counter for her to admire. Which she did, as the line grew longer behind me. 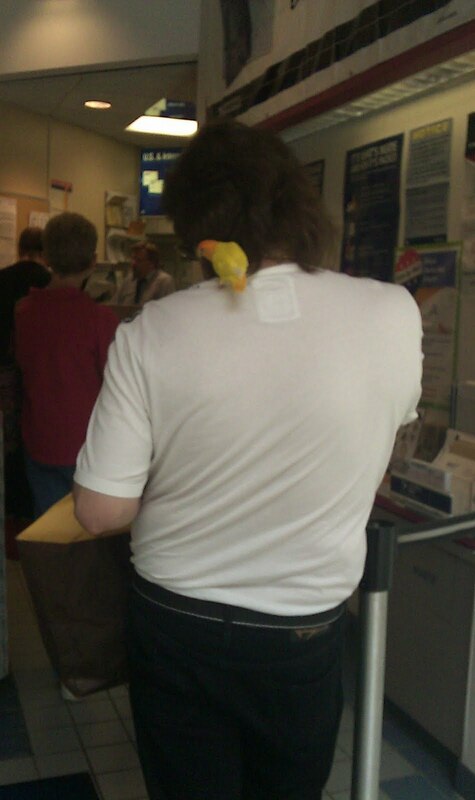 Package man was still at the counter in front of me, and birdman was chirping on and on about his bird, shutting up only long enough to give the bird kisses. The ladies behind me commented on how pretty the bird was, so birdman then scooped Sunshine up and brought him/her over to be admired and to say hello. HEL-LOOOOO... we're waiting here. Places to go, people to see, and all that. Mail your packages and get the flock out of here. Luckily package man finished up his business so I could buy my stamps and exit before I showed birdman my bird! I'm writing this as I wait for the timer to go off, telling me it is time to rinse the dye out of my hair. I'm going back to an old color I had used for years, Light Ash Brown, after a couple years of combining two colors together. The combination had worked well for a long time, but now I think the color ends up being too light. I don't know if Clairol changed the formulas or if my hair has just decided to do its own thing with the color. Hopefully I will like the end result. I leave next Sunday for my trip to Publishing University in New York, and I want to look good when I meet Barbra Streisand. Ha! I've been working on the wall quilt for the remodeled bathroom this weekend. Today I will do the actual quilting, then all that will be left is attaching the binding. I was really hoping to do some planting yesterday or today, but this weather does not put me in the mood for either buying plants or getting them in the ground. We are now just four weeks from the house/garden tour, and I am beginning to fret about whether the yard will be ready in time. It looks good, but I have seen a couple of the other gardens on the tour and they are GREAT. We need to step it up around here, and it doesn't help that Jim went up to Iowa this weekend. Even if we didn't get any planting done we still could be planning. Or fretting together. Katie spent yesterday organizing the stuff she brought home from school. She is setting up her containers by room, which will definitely help when she moves into her apartment in the fall. She is also purging clothes and other items she didn't use for the last nine months, and that is awesome. The Clean House folks would be proud. There's the buzzer, so I'm off! On Wednesday I drove over to Chicago in preparation of moving Katie home on Thursday. Her last final was Wednesday afternoon, and her check-out time from the dorm was set for 11:00 Thursday morning. The thunderstorms in St. Louis had made it impossible to get a good night's sleep Tuesday night, so I was a little concerned about being tired on the drive. And about whether I would be driving into the storm we had just experienced. But I popped in a surprisingly good book on CD, and fortunately only encountered rain as I got to the outskirts of Chicago. After checking into the hotel, I drove the car several blocks away to park in the garage next to her dorm, hoping to simplify the move out process. I gave Katie a quick call, hoping she might have gotten out of class early, and getting no response I walked back to the hotel. Just as I reached the building Katie called to say her phone had never rung, but she was in her dorm room. So I trudged back to the garage, stopping to retrieve the additional four plastic containers I had brought for her to pack additional belongings in. Several girls from the floor popped in while we were boxing things up, and it was interesting to hear them talk about the school year, and particularly their roommates. It seemed everyone had the same complaint about girls who have poor personal hygiene, who never picked things up, and apparently cooked and then never did the dishes. Katie had the same problems with her roommate. We finished packing her up by 4:30, so we went to grab some supper at a nearby pub. Then we went to my hotel room to surf the web and watch American Idol (my guilty pleasure, not hers). Thunderstorms rocked my world again early Thursday morning - great, another day of driving tired! I checked out of the hotel at 8:30, and hadn't really considered the fact that I would need to carry my overnight bag, my laptop and my cooler all the way back to the parking garage. At least the rain had stopped by then, although it was very gray and the city was socked in by fog. I dropped my stuff in the car, and luckily was able to snag one of the two boxes on wheels available for moving stuff. I was informed by the security guard at the desk that since it was not officially "move out" day, the other boxes had not been brought over yet. Hmmmm....They know kids are moving out because they sign up for check out times, but it is not "move out" day? Oh well, I had a cart so life was good. Katie had to come down and sign me in, and we made the first of three trips to the 19th floor. We found a way to take the wheeled box from the elevator, down a hallway to a different elevator and up to the second floor of the parking garage where I had parked. That was awesome as it had begun to rain again. We managed to squeeze all the stuff into my car (fortunately we had removed the center two seats prior to me making the trip), and were done by 10:00. No problems with check out and we were on our way by 11:20 and home by 4:30. In the fall Katie will live in an apartment with two other girls from school, so we won't have the dorm rules to deal with. I hope they have an inside elevator from the garage there, as that helped a lot. Now I just have to figure out where we are going to store all her stuff for three months. This is the first Mother's Day in 25 years that I will not have at least one of my children at home with me. It feels a little strange, and I am happy that I will be spending the day at a picnic with my sister and all of her extended family. But if I am being truly honest, I will admit that Mother's Day has never really felt like it was MY day. It has always been the day to honor my own mother. That may be because I was a daughter first, and a mother second. I don't really know. 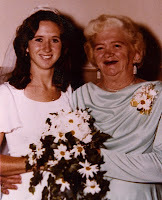 My mom died unexpectedly in 1989 when I was only 32 years old. 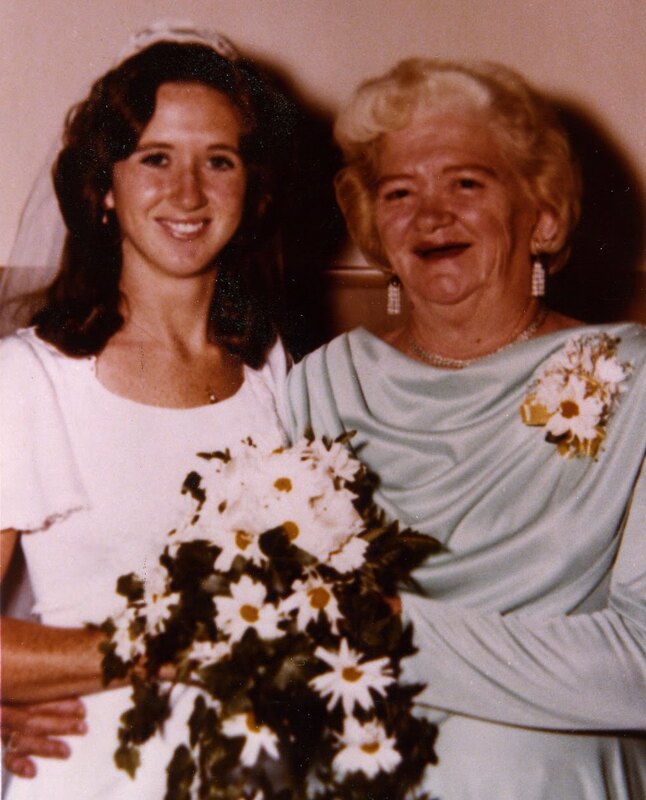 I think of her often, but especially on Mother's Day. For years I could not even look at the Mother's Day cards - I insisted that Jim pick out the card for his mom. I am over that now, but reading the sentimental verses is still hard for me. So as I go about the day, I offer up a prayer of thanks to my mom, for making my life possible. Love you, Mom! The C concourse security check-in at Lambert Airport was really busy when we were flying out last Thursday, so we went to the B concourse instead. I'm not sure it was a good idea as the B check-in only had one line open, and other people had been encouraged at C to avoid the lines by heading over to B. I think they do that so there is less work for them at C. But anyway, the line came to a screeching halt (or perhaps I should say sharp halt) when a carry-on bag caught the attention of the screening agent. "Whose bag is this! ," he bellowed. A young man waiting at the other end of the conveyor raised his hand. A lively discussion ensued. It turns out the man had saw blades in his carry-on bag. Yep, saw blades. Why? Who knows, but they let him take the bag on with him. It wasn't too long ago that you couldn't bring your nail clippers on board because they could be used as a weapon. Now saw blades are okay? I don't get it. As the line began to move again, the other agent reminded people to take their Ziploc bags containing lotion and other liquids out of their bags before they got up to the screening machine. "And any saw blades", she added with a laugh. Jim and his partner Ted has a business trip to New York last week sponsored by a company that sells commercial lighting. The local lighting rep, Vicky, was taking them and Ted's wife, Jill, and I tagged along. We flew out Thursday morning, and in the afternoon we walked down to Times Square for a bit before heading over to the lighting company for a buffet and presentation on the art of lighting. On Friday the guys were in meetings all day, so Jill and I headed out to play tourist. 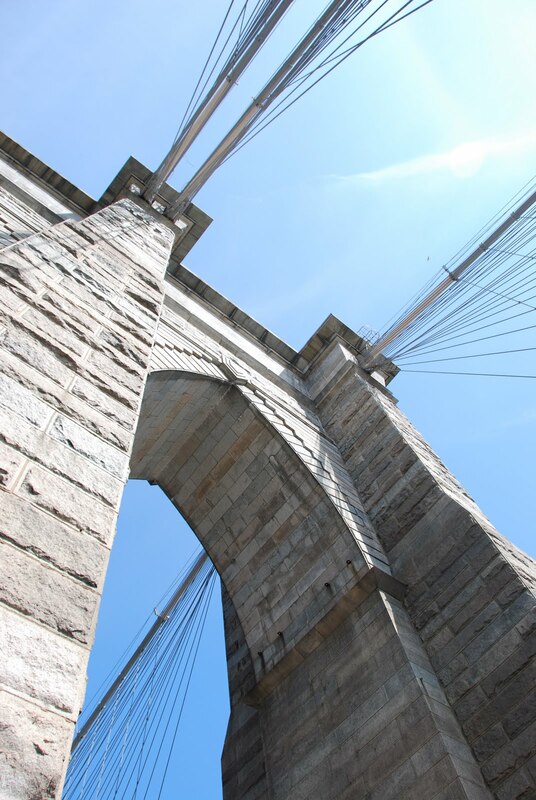 We walked the Brooklyn Bridge, which is something I have always wanted to do, visited South Street Seaport and had lunch on Pier 17. We saw Ground Zero and the sobering memorial at St. Paul's Church, which remained standing following the collapse of the twin towers, even though it is right across the street from where they stood. Following a brief respite at our hotel, the art deco New Yorker, we met up with the guys for a margarita party at 5:00. This was followed by a dinner harbor cruise on a private boat for the meeting attendees. It was wonderful! 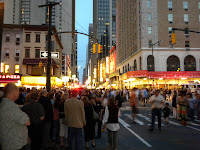 We had supper at John's Italian Restaurant on 12th, and then hailed cabs to take us to the Imperial Theater, which is located at 249 West 45th Street between 7th and 8th. The cab dropped us off on 7th at the corner of 45th, because 45th was closed by a barricade. Thinking the road was just closed to vehicle traffic, we began to follow others around the barricade only to be told we couldn't go down the street. "There's a bomb threat," one lady told us. Not knowing exactly which block the theater was in, we walked around the block to 8th street. 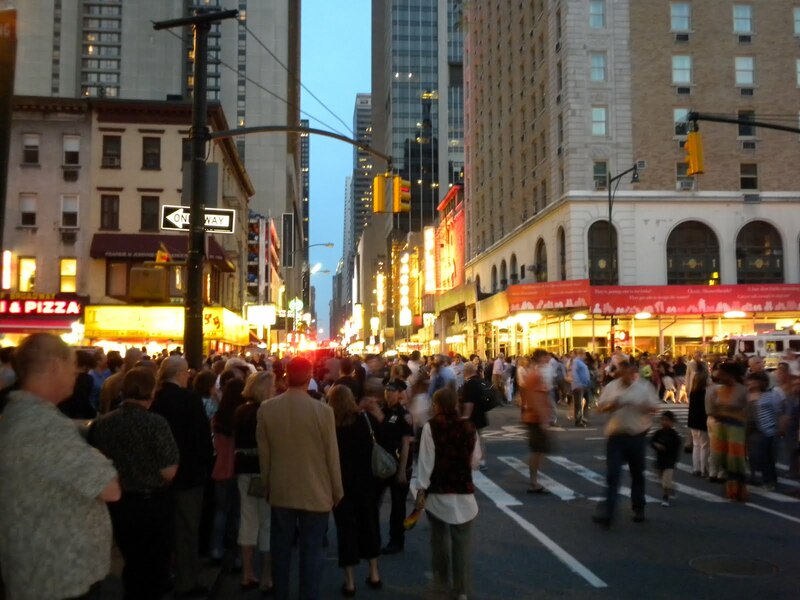 The sidewalks were jammed with other theater-goers and regular tourist traffic, and we all came to a screeching halt at the corner of 8th and 45th. At this time we could see the abundance of police and emergency vehicles on 45th. Waiting for a walk signal, we crossed 8th and walked a half block down 45th to regroup. It was 7:50 and the show started at 8:00. I called Andy and Katie both, hoping to find someone who could get on the internet to see what was going on. Neither picked up their phones. The police finally announced around 8:30 that "Lion King" was canceled (the vehicle with the bomb was near the Minskoff Theater located at 200 West 45th) but the other shows would have a late curtain. We sat on the curb to wait. In the meantime, 8th was kept open to traffic and we were all allowed to hang out on 45th. The other three went into Charley O's on the corner of 8th and 45th for a drink and Jim and I waited for information. At 9:00 the police said that the shows had begun and anyone in the theaters already were able to see them. Supposedly the theaters had taken a head count, determined there were enough people present, and decided the show must go on. Too bad for the rest of us outside. When we told the others at Charley O's what they said, another couple piped up. They had been in the Minskoff early to see "Lion King" and at 7:20 the theater was evacuated. They said no one was allowed to remain in the theater. So why did the police lie? To get us all to leave? I sure as hell would have left had I know there was a real bomb. Because we were allowed to remain so close and 8th was never closed, we all figured it was a false alarm - that perhaps there was an abandoned vehicle they were checking out or something. But we didn't know the seriousness until the next morning, so we hung out until 10:00 before we decided there would be no show after all. The next day we immediately turned on the news and found out there had indeed been a bomb in the vehicle. What was more shocking was the fact that Times Square had been evacuated. Seriously? The heart of Times Square is actually a couple blocks from where the car was located. We were a baseball throw away from the car, and we were allowed to just hang out there. As I said, vehicles continued to crawl past on 8th street. We all definitely would have been the most impacted had the bomb gone off. Because our flight was not scheduled to leave until 4:30 in the afternoon Sunday, we checked out of our rooms and left the bags with the hotel as we headed off for bagels. From there we went to High Line, a new trail built above ground on an old train trestle. It is really cool and I highly recommend going to see it. We were really enjoying ourselves until Ted got a call from American Airlines telling him that our flight had been canceled. The best they could do was to get us out Monday afternoon. They said it was canceled due to the bombing, so we didn't know if something else had happened, or had American been threatened? Spaids have younger children, and one of them was scheduled to leave for 6th grade camp on Monday. More importantly, Jill was supposed to be one of the drivers. They really needed to get back. They arranged to use frequent flier miles on Southwest, and took a train to Long Island's airport, then a plane to Buffalo, New York before flying home to St. Louis. Jim, Vicky and I just had to wait it out. We finished walking the trail and then I took them to Lombardi's for some great pizza. We walked back to Bryant Park for a drink, then back to the hotel. Monday we again checked out, had some breakfast, then walked over to Macy's. It is such a huge store as it is seven stories and covers a whole city block. We ended up going to the airport really early since we didn't know what security changes, if any, had been made. Plus American had assigned seats to Jim and Vicky, but not to me. As we waited at the gate for an agent to show up to check people in, the next gate over began making announcements. For the flight to Dallas, the agent was looking for 15-20 people to volunteer to give up their seats as they were overbooked. Now, these are not large planes to begin with, so what was American thinking? Before it was all said and done, she needed 30 people to give up their seats. That's when I began to worry that I might not get on my flight because everyone from Sunday night was going to be looking for a seat. I finally snagged an agent at 3:00 who took pity on me and gave me a seat assignment. At that point we headed to the bar for a well-deserved drink. The flight home was fortunately uneventful. When I heard this morning that the POS, oops I meant suspect, had been apprehended at Kennedy Airport Monday night, all I could think was thank God. Thank God they found him, and THANK GOD he was not at Laguardia with us Monday night. Once close brush with him on Saturday night was enough. And just think - I get to go back to New York in 3 weeks. This has certainly dimmed my enthusiasm somewhat!